Is there life after you get on an internet forum and insult a bunch of your fans? 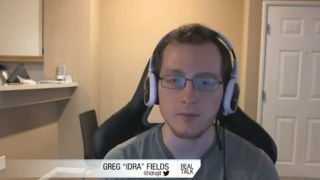 Things weren't looking great for notorious eSports personality Greg "IdrA" Fields after doing just that last week ; the well-known pro StarCraft player was promptly removed from his team, Evil Geniuses. Over the weekend he did a YouTube interview with gaming show Real Talk, where he revealed that he probably wasn't going to try and find a home elsewhere—he's looking into commentating instead. "I was obviously not happy with what I was doing before," he begins. "I felt it was pretty stagnant." Fields' departure from EG has been in the works for awhile, and later reveals that it's unlikely he'll rejoin the game: "I am not going to continue as a competitive player. It's just gotten to the point where competition is not enjoyable for me any more." Still, he admits that his removal from Evil Geniuses—who he had been with since 2010—opened up new opportunities for him, and he'll be using them to hopefully step back from the playing field and get into commentating instead, saying that he would "like to be the analytical commentator for whatever major events I can." Fields will still be playing on his Twitch channel , so he's not disappearing from the scene any time soon. I've always found him very entertaining to watch, and it'll be interesting to see where he takes his talent next.